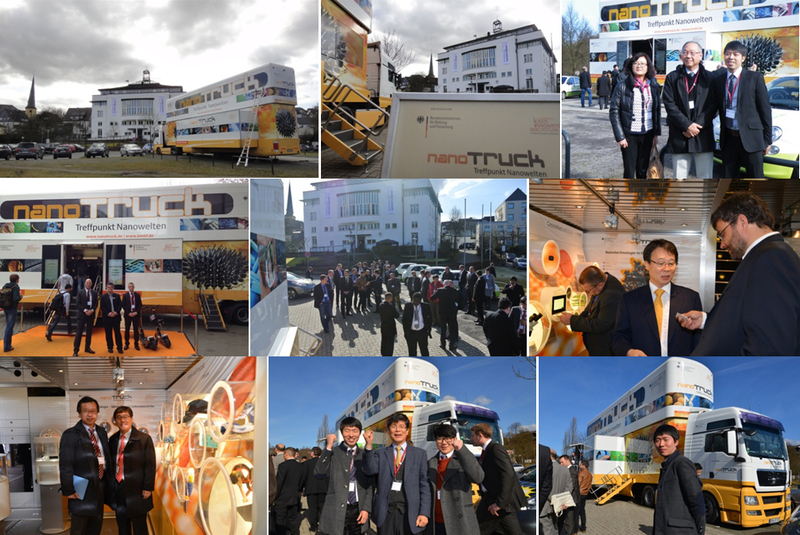 The nanoTruck has been entertained by the German Federal Ministry of Education and Research (BMBF) from 2004 through 2014. The double-deck vehicle had a length of 16,5 m and at full expo-expansion a width of 7,5 m. The exhibition inside offered theoretical and practical access to nanotechnology with an exhibit, nano-cinema, multimedia terminals and multifunctional presentation and event space. Three of the exhibits were from Zoz, namely the high-performance cement/concrete FuturZement|FuturBeton, the super-light-weight Al-CNT-composite Zentallium® and the solid-state absorber tank H2Tank2Go®. Under the campaign “meeting-point nano-worlds” (Treffpunkt Nanowelten), the nanoTruck came to Wenden/Germany for OZ-12 and for OZ-14. The InnoTruck has been inaugurated by Federal Minister Prof. Johanna Wanka (BMBF) on the occasion of Hannover Fair (HMI) in April 2017 under the campaign “technology and ideas for tomorrow” (Technik und Ideen für morgen). Upon our request in Hannover, we very much appreciate the confirmation (received 18.07.2017) by BMBF, that the InnoTruck will join OZ 18 at Wenden ! FuturBeton specimens made with nanostructured FuturZement were stored under water for 1 year and then broken by force. The fracture surfaces demonstrate, that fracture develops through the middle of the stones in the concrete, which means that the “binder” FuturZement even after a year in water binds better than what is to be bond together ! No better way to show ! FuturBeton has been utilized to build the public bridge “Rosenthal” at the county of Olpe in 2012 and for a smaller 12-tons demonstrator (balustrade Villa ZCS) in the center of Siegen, both in Germany. H2Tank2Go® represents a solid-state absorber hydrogen tank-system small enough to be replaced “empty to full” at the next tank vending machine or home-depot, equipped with a click’n’go system for replacing tanks on the vehicle within seconds. The tanks are “powder”-loaded with Hydrolium®, a nanostructured RT-metal-hydride allowing to store hydrogen virtually pressure-less by solid state sorption, environmentally friendly and cost effective. Demonstrating reasonable energy storage for mobile & stationary application at superior safety level, utilizing existing infrastructure, brilliantly simple, flexible by multi-tank-operation, the related “Power to Gas to Fuel” scenario (P2G2F®) was nominated for the German environmental award in 2013.